In today’s data center, direct attached cable (DAC) is widely used for interconnection. With 40G migration, DAC becomes more popular, because they can support the high data rate and complete the interconnection in short time effectively. Currently, there are three types of DACs: passive copper cable, active copper cable and active optical cable (AOC). However, different DAC have different performances and prices. Passive or active? Copper or optical? Which DAC is the one you need? In data center, the battle between performance, transmission distance and cost has never ended. This is also true to the selection of DAC for 40G data center interconnection. To find a cost-effective 40G DAC solution for data center interconnection with reliability and stability, this article will provide you the solution by several rounds of battle between the three types of DAC. The first round of battle is transmission distance which is always the first factors to be considered during the selection of DAC. This is because it is closely related to the transmission distance. There is no wonder that optical cable can transmit signals over longer distance than that of the copper cable. When the data rate required for interconnection is less than 5 Gbps, the passive copper cable is usually used for interconnection in data center. However, they can only support 40G transmission over really short distance. Optical cable is used to overcome the challenge of the distance. Supported with connectors that are embedded with electronics/optics, 40G active optical cable can support 40G transmission up to 100 meters. 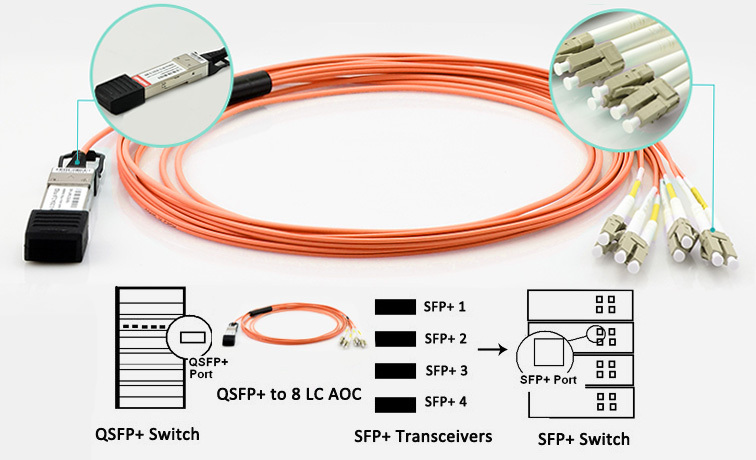 Active copper cable can support 40G transmission over copper cable up to 15 meters with QSFP+ connector embedded with electronics. 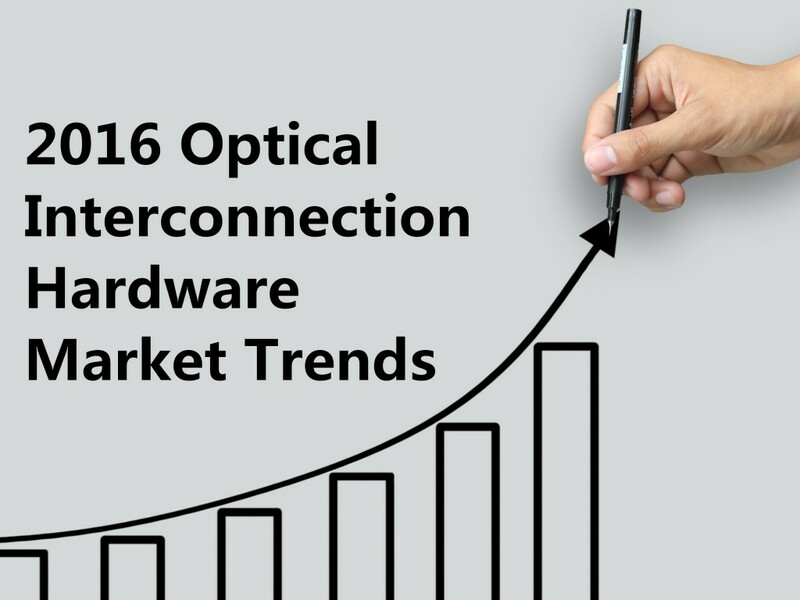 In the battle over transmission distance, optical active cable wins without doubt. The connectors attached with AOC and active copper cable are the main reason why the two cables can support 40G transmission over longer distance than that of passive copper cable. AOC which can support the longest 40G transmission distance is with the highest power consumption—more than 2W. The power consumption for active copper cable is only 440mW. However, passive copper cable requires no power during the transmission. In this battle, passive copper cable wins and AOC lost its advantages and is in the third place. Cooling is closely related to data center reliability and life of use. The DAC in the data center can also affect the cooling of data center. The cable size and power consumption will directly influence the cooling efficiency of the data center. The thinner the cable is, the better dispersion devices in data center would have. Among the three types of DACs, optical cable is the thinnest among the three types of DAC. Active copper cable is also thinner than passive cooper cable. Active copper is also thinner than passive cooper cable. As mentioned, AOC has the highest power consumption and active copper cable has a lower power consumption, while passive copper cable requires no power. In this round of battle, it’s hard to tell which one wins. It depends on the practical and specific situations in the data center. It is clear that copper is much cheaper than optical cable. AOC, with connectors embedded with electronics and/or optics is the most expensive one. AOC is strongly recommended if cost is not a problem. It has the best transmission performance. However, for many data centers, it’s hard to have an ideal situation like this. Cost sometime can determine the final decision of the choice in data center cabling. Most of the components in data center are expensive and require careful maintenance. Passive copper cable is much cheaper than AOC. However, it cannot support 40G transmission in most cases in data center. Active copper cable is less expensive than AOC and can support longer transmission than passive copper cable seems to be a good choice. After several rounds of battle, the price and performances of the three DACs are clear. What to be considered next is the practical application. After several rounds of battle, the price and performances of the three DACs are clear. What to be considered next is the practical application. In most data center, most server to server connections require 2-5 meters, while rack to rack connections are required to be connected by 8-12 meters cables. For 40G transmission, the application of passive copper cable is limited because it only supports really short transmission distance. AOC has the best transmission performance. However, it costs most in both material and daily use. It’s expensive and needs more power. And in daily maintenance, they need careful management, because the optical cables are fragile. If cost is not a problem, then AOC is suggested for 40G transmission. What to be considered next is the practical application. In most data center, most server to server connections require 2-5 meters, while rack to rack connections are required to be connected by 8-12 meters cables. 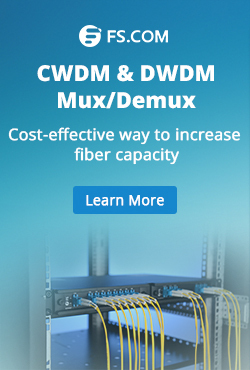 Due to the Active copper cable, which is less expensive and can support 40G transmission up to 15 meters with low power consumption, can satisfy the regular interconnection requirement for distance and cooling in most data center. For the cost, you also don’t need to worry about, as it is much cheaper than AOC and it is stronger than AOC during cabling and daily maintenance. If you are looking for an economical solution to upgrade your data center to 40G, then active copper cable won’t let you down. The following chart can illustrate the advantages of active copper cable clearly. FS.COM provides a full range of 40G active copper cables of high quality. All the connectors and cable lengths can be customized according to your applications. You contact sales@fs.com for more details. This entry was posted in Network Solutions and tagged active copper cable, active optical cable, AOC, DAC, passive copper cable on February 15, 2016 by Alice Gui. 40G transmission is very common in the backbone network now. However, not all the devices and network are upgraded to 40G. To adapting the network between devices and network of different data rate. It is necessary to connection 40G devices to 10G devices for network interconnection. To solve this problem, fanout technology is be accepted and widely used in data center. Fanout products for interconnection is easy to understand. It’s kind of like the water pipeline in our building: water is transferred from the trunk pipeline in a building. Then trunk pipeline fans out into several pipelines that have smaller diameters to bring the water to every house. This post will introduce several Fanout products that are commonly used for 40G data center interconnection. The first fanout component is 40G MPO fanout cable, also called breakout cable or harness cable. MPO fanout cable is a multi-fiber optical cable with one end terminated with a male/female MPO connector and the other end attached with several LC connectors. Actually, there are various types of MPO fanout cables, according to connector type, cable length and cable type. But they all have the similar structure. Here will introduce three most popular MPO fanout cables according to the package type. The first one to be introduced is also what most customer need. This cable is fan out into 12 fibers or 24 fibers. The above picture shows a typical 12-fiber MPO harness cable. The MPO connector of this fanout cable is linked to 6 duplex LC connectors, which is really useful for backbone cabling from 40G devices to 10G devices. The second one is a little bit smaller version of the former. The fibers are fanout directly from the MPO connectors. With small size, this kind of mini MPO harness cable can be easily put into patch panel and increase the cabling density largely and effectively. The third to be introduced is a special one—MPO cassette. Literally, it looks like a cassette and looks very different from other MPO fanout cables. However, when you look inside the cassette, it has not much difference from other MPO fanout cables. MPO Cassette actually contains one or several mini MPO fanout cables in side the cassette, which is designed for those who want have everything in clean and tidy status. As it can be installed in a standard rack and the cables are all well protected. A 12-fiber MPO cassette usually has a 12-fiber mini MPO fanout cable in side the cassette, with a MPO connector on the backside and 12 LC connector in the front. For a 24-fiber MPO cassette, there could be a 24-fiber fanout cable or two 12-fiber cables inside. The following picture is a MPO cassette with two 12-fiber MPO fanout cable inside it, thus there are two MPO connector on its backside. 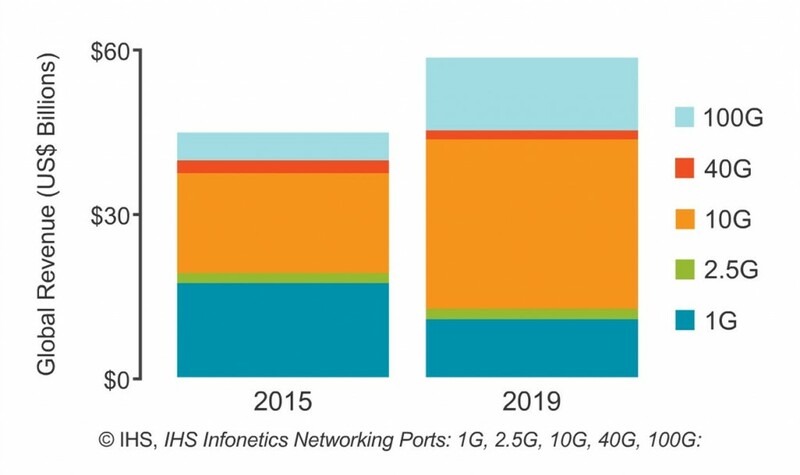 To decrease the 40G interconnection cost, Direct attach cable (DAC) is being widely used. There are also fanout versions of 40G DAC which support 40G to 10G cabling. 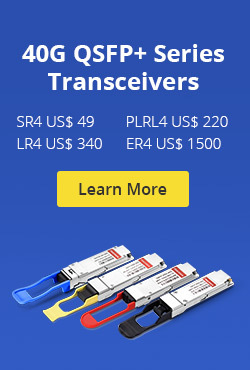 These kind of 40G DAC usually have one QSFP+ connector on one end and four SFP+/XFP connectors or several LC connectors at the other end. For example, the following is 40G QSFP+ to 8 LC DAC. The QSFP+ connector of it can be used to plug in the 40G device which has QSFP+ port. 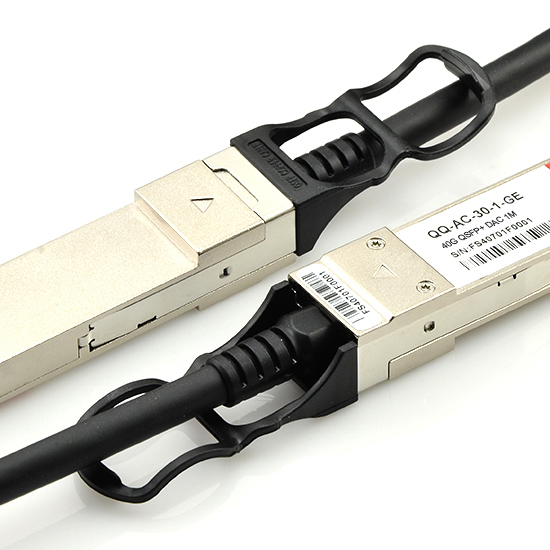 On the other end, the four duplex LC connectors are used to separately connect four SFP+ transceivers , which are used to plug in 10G devices with SFP+ switched (shown in the following picture). If you used a 40G QSFP+ to 4 SFP+ DAC, this process would be easier, cause the SFP+ connector can be plugged into the SFP+ switch directly. All in all, fanout technology plays an important role in the 40G data center for both connecting devices supporting different data rate and distribution. Most fanout products are factory pre-terminated. The installation and maintenance doesn’t need many skills. In Fiberstore, a variety of fanout products of high quality and reliability can be customized according to your application. If you are seeking for solutions for fanout product, please feel free to contact sales@fs.com for more details. This entry was posted in Direct Attach Cable, Fiber Cabling, MPO Assemblies, Network Solutions and tagged 40G QSFP+ fanout cable, DAC, fanout cables, MPO fanout cable, MPO harness cable on February 7, 2016 by Alice Gui.